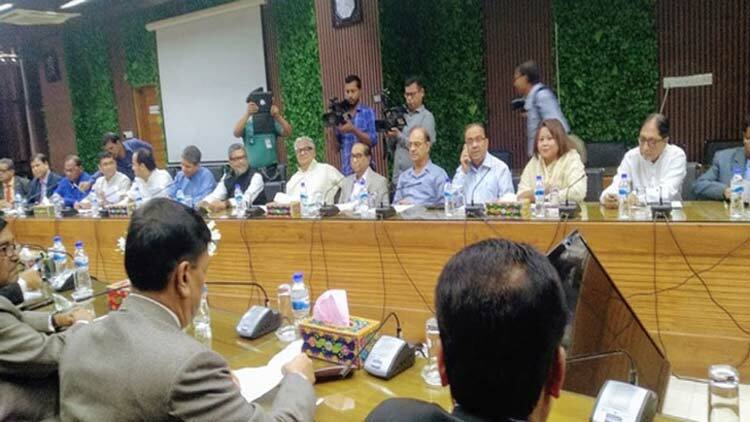 Awami League Election Steering Committee Co-Chairman HT Imam on Wednesday said it is the soul jurisdiction of the Election Commission (EC) to declare the polls schedule. “The Election Commission can declare the election schedule whenever it wants. We would not say anything on the declaration of the date of announcing election schedule either ahead or later,” he told the reporters after emerging from a meeting with the Election Commission at Nirbachan Bhaban in city’s Agargaon. A 16-member delegation of Awami League led by HT Imam represented the party at the meeting with the Election Commission. He said earlier different political parties and alliances had meetings with the Chief Election Commissioner and Election Commissioners but none of the leader cast slur on the EC or issued threats to it excepting the Jatiya Oikyafront. Imam said some leaders of the Jatiya Oikyafront behaved in very indecent ways with the commissioners to the utter surprise and amazement of the common people. All political organizations irrespective of party affiliations condemned their behavior, he added. “We want to say in an unequivocal term that the people of Bangladesh would not accept their (Oikyafront) such behavior and will give them a befitting reply through ballots,” the co-chairman said. The AL election steering committee demanded to entrust government employees with the tasks of conducting election as polling officers, Imam said. “It would require about seven lakh personnel excepting members of the law-enforcement agencies at 300 constituencies during election,” he added. rules and regulations.” Imam said, adding that the Awami League is in favour of using Electronic Voting Machines (EVMs) and to keep special arrangements for women and the persons with disabilities. He said the Awami League did never exert any influence on the Election Commission in the past and it would not do so in future.